Part three is finally here. If you are searching for the rest of the collection, you can find part one and part two here. I split these up into smaller groups so that the photos load quickly, and so that you guys aren't overwhelmed with a ten polish collection all at once. 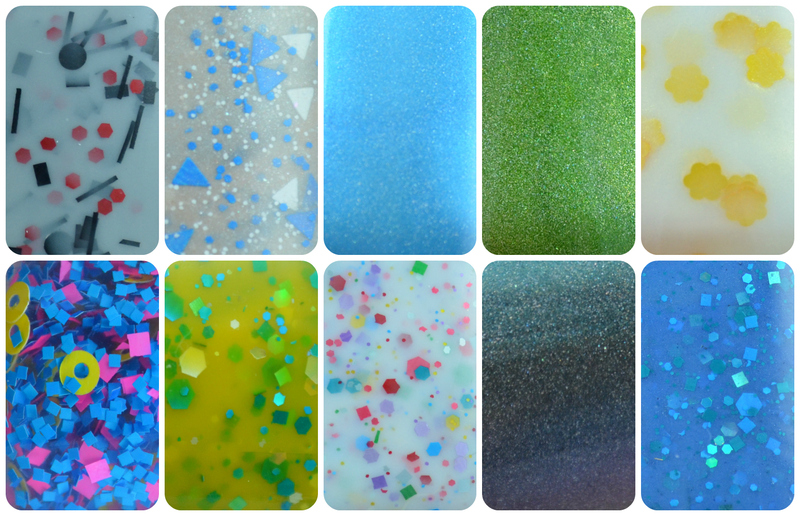 Dunkacrelly is a white crelly with rainbow colored glitter in various sizes. It smells like sweet vanilla frosting, and is not at all overpowering. The inspiration came from the best snack of the 90's, Dunkaroos! Pictured above is three coats with no base color. The formula was a little on the thin side, but it was nicely pigmented. All of the glitter came out easily, so I didn't have to fish for it at all. This is another one of those colors I would recommend picking up if you only want to get a few. 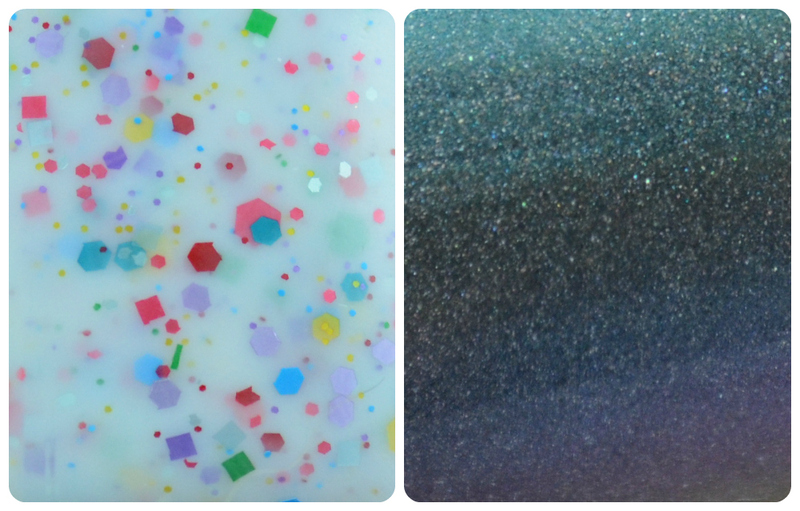 Moody is a green shimmer with holographic pigment. Pictured above is three coats with no base color. This was originally going to be part of the Totally Rad collection, but I believe that Jennifer is going to tweak it a little bit more before it is released. Moody is a blue, pink, and purple holographic multi chrome. This color was inspired by the ever popular mood ring. I can't speak for you, but I know I had at least two! The formula on Moody was excellent. It is highly pigmented without being thick. I used three coats for my swatches, but if you like a little more sheer of a color you could wear two coats. I think it looked nice both ways. For those of you who are huge indie nuts like I am, this color is very different from KB Shimmer's Rollin' With the Chromies. Moody has darker tones while Rollin' With the Chromies is a significant bit brighter. Both colors are gorgeous, but they are extremely different. Moody is another color I highly recommend picking up! That completely wraps up the Totally Rad collection. If you can't make up your mind on which ones to order, my favorites were: Dunkacrelly, Slimed, Moody, and Away Message. Thanks for sticking with me through this three day journey! Please head over to Finger Lickin' Lacquer when you get a chance and show her some love. Again that green is calling to me, its so gorgeous! Dunkacrelly has got to be my favorite of this entire line! It's the most perfect white crelly to ever exist, and it's named for my favorite treats. I love all three of these colors but Moody is just amazing!